Rumors of the upcoming Nikon D600 are surfacing from sources around the world. The September 2012 issue of Foto Magazin (German) features a Photokina 2012 preview, including upcoming Nikon products on page 28 along with a “top secret” photo of the D600. The photo is a rendering of the camera by Zoran Petrovicz and appears to be made using a modified D800 image. The article contains details previously leaked from Nikon Rumors. 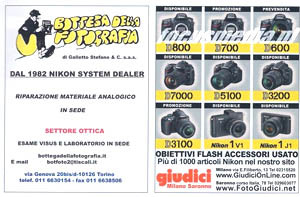 Nikon Magazine (Italy) published an advertisement by retailer Giudici containing a Nikon D600 in the camera lineup along side the D800 and D700. The photo appears to actually be a D800. The text above the picture reads “prevendita” which translates to advance or presale. You can see a copy of this ad at Focus. The D600 is highly anticipated to be announced before or during the biennial Photokina show September 18-23, 2012 in Cologne, Germany. It is expected to be a breakthrough entry-level full-frame camera targeted at amateurs and enthusiasts. The size and build level will similar to the D7000, but feature a 24MP full-frame sensor. Full D600 specifications have been leaked well in advance of the upcoming announcement. Photos of the Nikon D600 have appeared around the web showing the affordable compact-body FX DSLR. This entry was posted in D600 by D600 Admin. Bookmark the permalink.